Road number 99 1594-3 is currently being overhauled at the steam locomotive facility in Meinigen and is to be used again on the line for the Preßnitz Valley Railroad starting in May. 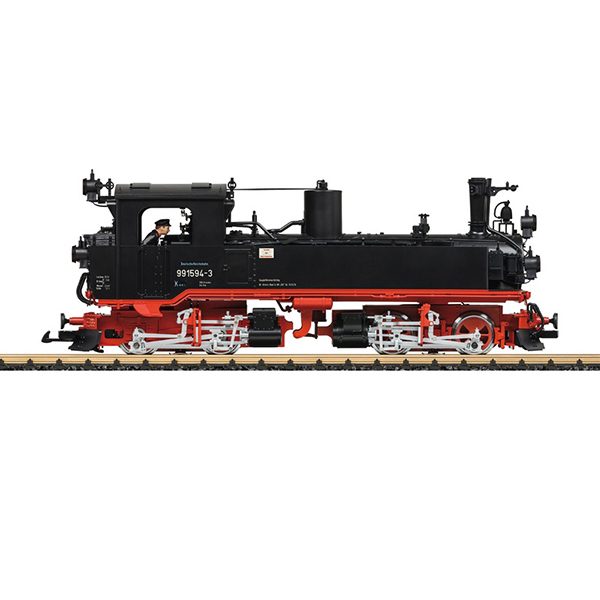 Product: This is a model of the class IVK Meyer locomotive in the version as a "Rekolok" / "Overhauled Locomotive" on the DR. The paint and lettering are prototypical for Era VI as a museum locomotive on the Pressnitz Valley Railroad as it will appear there in use starting in May. Two powerful Bühler motors with ball bearings drive all of the wheel sets. Traction tires. The locomotive has an mfx/DCC decoder with many sound and light functions, such as headlights that change over with the direction of travel, cab lighting, and a smoke unit with steam exhaust synchronized with the wheels. Length over the buffers 48 cm / 18-7/8". Steam exhaust synchronized with the wheels for the first time. The cars to go with this locomotive are available under item numbers 36358 and 36359.